CF Zero Length flange adaptors are used to change from one size of tube or flange to another size enabling the fitting together of mismatched components and there is limited space. Manufactured from: 304L Stainless Steel. They are supplied in a plastic bag with protective plastic caps. 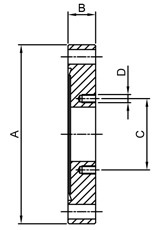 The CF Zero Length flange adaptors are manufactured to the CF Standard and are compatible with other supplier’s product.